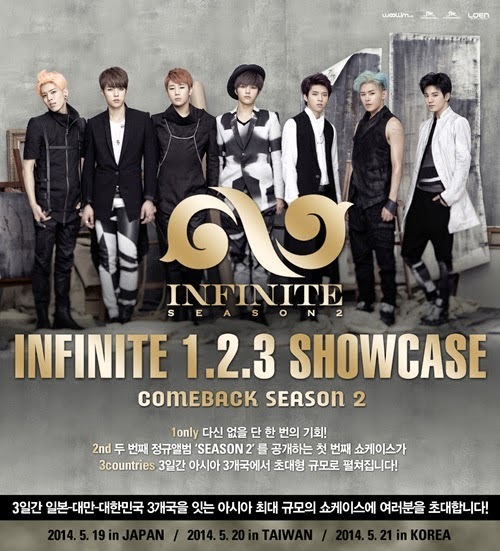 Infinite will hold a three day showcase in Korea, Japan and Taiwan prior to the release of their new album "Season 2". On May 13th, Infinite unveiled a poster through their official website about the upcoming large-scale showcases in the 3 big countries. The showcase will be held in Japan on May 19th, 20th in Taiwan and the 21st in Korea which is also the release date of the new album. In particular, the showcase's name is "1.2.3" and carries a message as "A chance that won't appear again","2nd studio album","3 days showcases in 3 Asian countries". In addition, Infinite's "1.2.3" showcase in Korea on May 21st will take place at Jamsil Student's Gymnasium at 8pm kst with more than 5000 fans.